Q: According to reports, the ROK Foreign Ministry said that the Chinese government will send Vice Premier of the State Council Liu Yandong to attend the closing ceremony of the Pyeongchang Winter Olympic Games. What is China's consideration behind sending Vice Premier Liu Yandong to attend the closing ceremony? A: China congratulates on the successful opening of the Pyeongchang Winter Olympic Games. China is always an active supporter of the Olympic Games. We endorse the efforts made by the ROK to ensure the success of the Pyeongchang Winter Olympic Games. 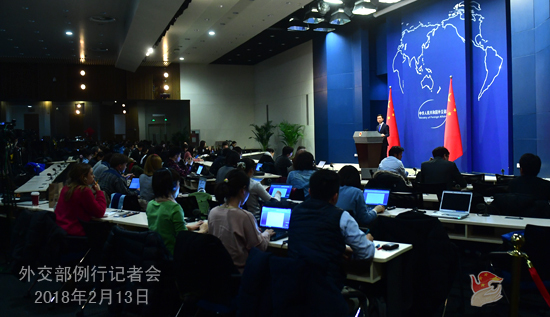 If we have further information on China's attendance at the Pyeongchang Winter Olympic Games, we will release it in due course. Q: According to reports, the ROK Ministry of Unification said that the ROK side will give priority to promoting dialogue between the DPRK and the US. Meanwhile, the US Vice President Mike Pence said in an interview that the US and the ROK have agreed on terms for further diplomatic engagement with the DPRK, first with the ROK and then possibly leading to talks with the United States. The US would keep up its "maximum pressure campaign" while opening up to possible talks at the same time. What is your comment on this? A: We have noted relevant reports. We welcome the positive developments with regard to the situation on the Korean Peninsula. 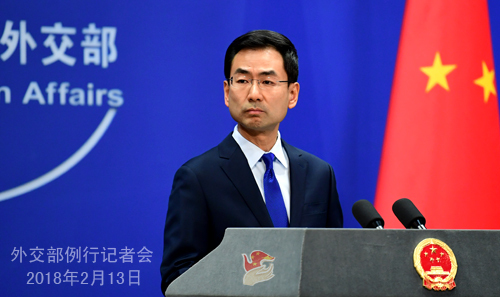 China always believes that the Korean Peninsula issue, in the final analysis, should be resolved through dialogue and negotiation. We hope that the DPRK and the ROK can build on the hard-won momentum of engagement and interactions on the Winter Olympic Games to gradually open the door for political dialogue. The core of the Korean Peninsula issue is the DPRK-US contradiction. We hope that the interactions between the DPRK and the ROK can bring about the ones between the DPRK and the US. Only imposing sanctions and pressure cannot resolve the Korean Peninsula issue. Dialogue and negotiation are also indispensable. Timely efforts should be made to turn the pressure of sanctions into the driving force behind the resumption of negotiation. We hope that the DPRK and the US could seize the current window of opportunity, demonstrate goodwill to each other, work for the shared goal and take meaningful steps in a timely and decisive fashion. While we are heartened by the encouraging signs on the arenas of the Pyeongchang Winter Olympic Games, the international community should show more encouragement and support, help steer the situation on the Peninsula towards the right direction, make concrete efforts for the real turnaround of the situation and strive to realize the denuclearization of the Peninsula and achieve the lasting peace on the Peninsula at an early date. Q: The British Defense Secretary told the Australian media that Britain would send a warship next month through the South China Sea to express rights of navigation. Does China have any comment on this? A: We have noted relevant reports. All countries are entitled to the freedom of navigation and overflight in the South China Sea as per international law. Under the concerted efforts of China and other littoral countries in the South China Sea, there has never been any problem with the freedom of navigation and overflight in the South China Sea, and the situation there has been improving. We hope that relevant parties, especially non-regional countries, could respect the efforts made by regional countries to safeguard peace and stability in the region. 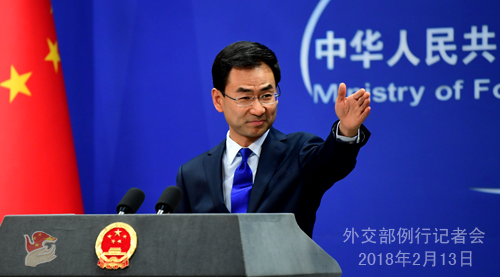 As I said last week, when the South China Sea is enjoying gentle breezes and calm waves, there shall not be any attempt to set winds blowing and waves rolling. Q: According to reports, on February 10, former President of Maldives Mohamed Nasheed, when giving an interview to the Times of India, said that the Chinese now have taken control of as many as 17 islands in the Maldives and that this is "land grab". He does not think this is a bilateral problem between China and the Maldives and believes that it is "an international issue and international human rights issue". It has to do with separation and colonialism and should be dealt with multilaterally. Abdulla Yameen is its internal driver while China is its external driver. He added that if he returned to power, he would seek help from the international community against the "land grab". What is your response to this? A: Last week I made response to the similar remarks of Mr. Nasheed. His latest remarks are no different from his previous ones-nothing short of sheer fabrication and ridiculous. I must remind Mr. Nasheed that it is the people of China and the Maldives that are in the best position to judge whether China-Maldives cooperation serves their common interests and can deliver benefits to the two countries and two peoples. It can by no means be denigrated by the one-sided story of certain people. Q: Heathrow Airport apologized yesterday after claims were made by someone that Chinese consumers were being unfairly treated at the duty-free shop. Does the Foreign Ministry have a comment on this? A: My understanding is that this is an issue between the shop and its consumers. It's not the first time that such things happened, nor the last time, I am afraid. This time, it involved Britain; next time, it might be another country. For issues like this, just do what must be done.